The movers arrived at 9:00. 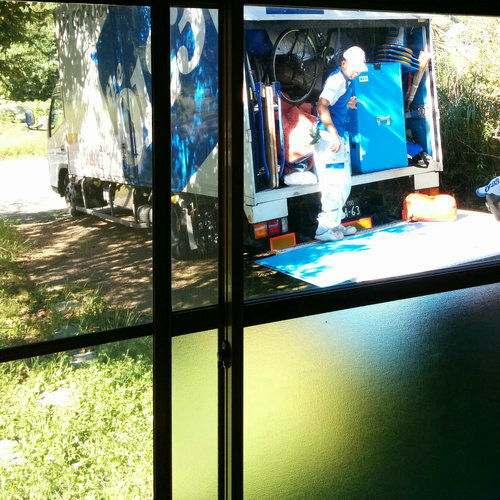 90 minutes later, everything in that truck was in the house. How did we get so much stuff and where is it all supposed to go? We've spent a few days now sorting through boxes and trying to put our square peg into this round hole. My favorite Japanese word is currently toriaizu which is means "for now" and is how everything in the house is deployed. It will get moved or rearranged later, but toriaizu OK desu. 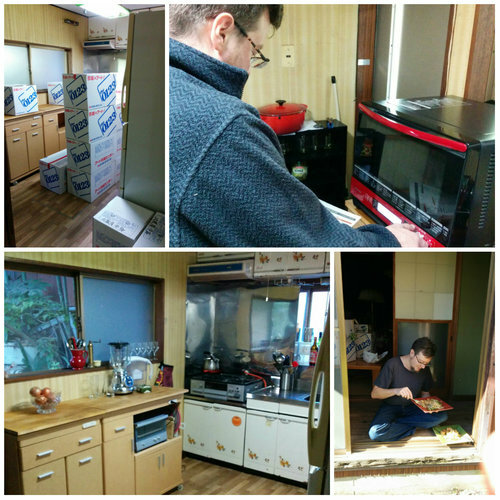 Kitchen full of boxes; Tod testing the new oven; unpacked kitchen (toriaizu); first meal in the new house. This house has been mostly uninhabited for a very long time and it is filthy. I attacked the kitchen and with the help of Tod & our neighbor, Chris, got it cleaned and unpacked on the first day. I used so much degreaser that I had to send Tod out for more and I still am not finished. But it's toriaizu OK. We have cooked many meals here already. Our appliances arrived over the course of two days, so now we have a gas cooktop, an oven, and a washing machine. 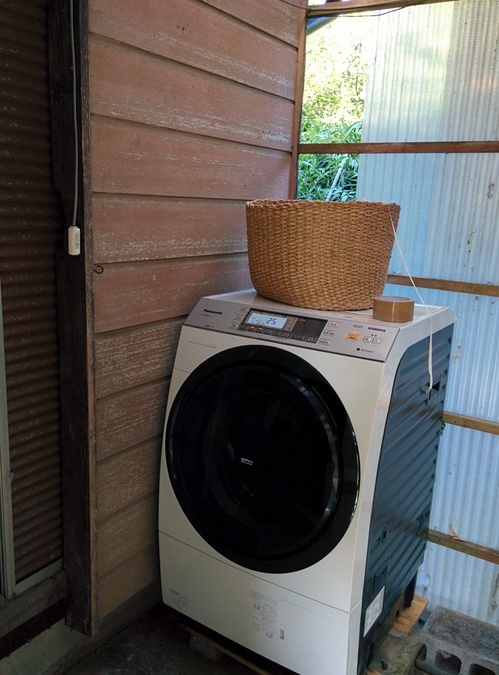 The washing machine lives outside. There is a lot more to do: unpacking, organising, cleaning, and some moderate and major repairs. But toriaizu OK desu! Today we are off to enjoy a harvest festival in the rain and meet some of the extended community of creative anarchists who live out here.